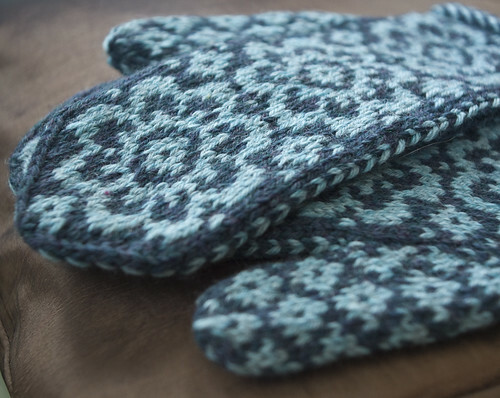 Hot off Virginia’s needles are these fabulous mittens. 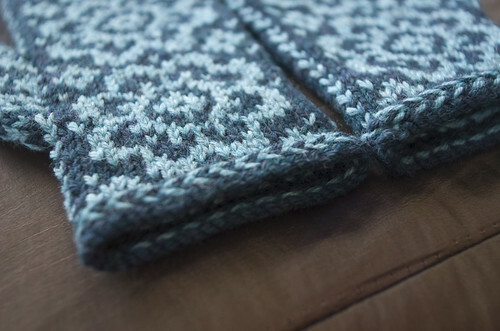 They are knit using Cascade 220. Pattern is by Mandy Powers, called “End of May.” They will fit right in with this Middle of January. While the mittens were blocking I was playing in the kitchen, trying to start making a dent in the bulk, two pounds of yeast I had bought a few weeks back. 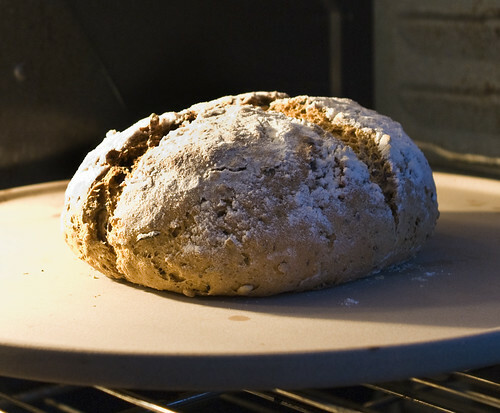 The bread was inspired by a desire to eat less refined foods (including flour, sugar, etc…). It’s made with a whole wheat flour sponge, but crammed inside are all sorts of goodies, like wild rice, barley, molasses, flax seed meal, sunflower seeds and some caraway seeds. I call it (End of) Earth Bread (not to be confused with the Earth Bread recipes floating around out there that are laden with oil and sugar), and think it would by a necessary addition should there be an End of Earth. Virginia thinks I’ve been watching too many post-apocalyptic shows lately (she’s right about that). But, I have to say a few loaves of this and you’d be good to go. 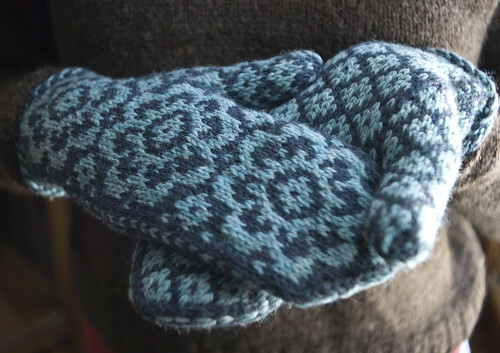 The blues of your mittens are fantastic! I like the braided edge, too. Wonderful! A cookbook you might like is “The Great Scandinavian Baking Book” by Beatrice Ojakangas. I got a copy for my birthday – lots of rye breads that are delicious! Your recipe sounds tasty, too. I especially like flax seed! The mittens look so warm! Perfect for Minnesota! Virginia, they are really pretty. Dan, your bread looks great, too!